We answered several of the questions we got during the survey in Answering Your Questions, Part 1 back in February. That set of questions dealt with us personally and the blog itself. This week, we’re tackling the content questions! What are some of the answers to these justice problems in your opinion? Michelle: I’m not sure how answerable this question is, but I love it! This is what we answer in each post. From the beginning of Tuesday Justice, our model for most posts is “here’s the problem, here’s what’s being done about it, here’s how you can get involved.” Whether or not what’s being done is going to solve the problem is another story, but hopefully, it’s at least helpful on some level, and we do our best to vet those solutions before we publish our posts. For a lot of what we talk about, the ultimate solutions would require equal treatment before the law, poverty alleviation, equality in education & opportunity, and other such development goals. But there’s an element of symptom treatment in some of this. While we want to fix the root causes of injustice, we also want to alleviate some of the immediate suffering people are facing. We have to use a both/and approach. What situation have you been made aware of which had a “perfect storm” of factors such as poverty, slavery & immigration as the root cause? How do you build friendships with people of another race? Channon: I think the most important thing to remember is that people are just people! We are all human beings and are all on this journey called life. We all experience love, joy, sadness, pain, heartache, healing, etc., and if we can always remember that in the back of our minds, then it will be easier to relate to people, even if they aren’t the same race as you! Take for example me and Michelle: We met in the UK, doing the same Masters degree, learning more about a subject that we both are passionate about. And we instantly clicked and became good friends (and are still to this day)! We also connected through our shared faith and ultimately because Michelle is just a great person and someone who I wanted to have a lasting friendship with. Even though we are black and white, we don’t dwell on that, instead we choose to focus on our shared interests, passions and genuine like of each other! So focus on the shared and similar interests with someone from another race and not your differences or the fact that you’re from different races. Michelle: Yes, yes, yes to what Channon said! There are times when I, as a white person, need to understand how Channon’s experiences, as a black woman, are different than mine. And while it’s important to recognize that, when it comes to beginning a friendship, we often connect with others based on our shared experiences. What do you think the most important way to prevent social justice problems is? Channon: I don’t think there is one single, important way to prevent social justice problems. I think a couple of things need to be implemented in order to find success in preventing these issues globally. First, we must acknowledge deep-rooted hurts from the past. Brokenness within certain communities needs to be dealt with and forgiveness and healing needs to happen. Safe spaces have to be created for underrepresented groups’ voices to be heard and their opinions and ideas acknowledged. Also, I believe policies and laws have to be more strict when it comes to dealing with issues such as trafficking, modern day slavery in all of its forms. Also, plans have to be put in place so that poverty can be eliminated, so that people can live their lives comfortably without having to worry about where their next meal is coming from or whether they can afford to send their children to school. Looking at all of these things that have to be done is a HUGE task and slightly overwhelming, but Michelle and I have hope that one day we will get there! Do you feel people should do more due diligence on what is being reported on the news before forming opinions on the issue? Also, we sometimes have dirty grids from past hurts that skew our opinions. How can we separate opinions from facts to not make an immediate emotional judgment? Michelle: To answer the first two questions, YES. Yes, we should all do our due diligence before forming opinions. And yes, we all have dirty grids. (I’ve never heard the term “dirty grid” before; I’m just guessing it’s meaning from context.) Depending on where you grew up, who you’re around, which news gets to your feed, it’s tough to separate fact from opinion and take varying viewpoints into consideration. No one is completely neutral, and we all need to start from the understanding that our viewpoints on social justice issues HAVE BEEN affected by a number of variables. That’s key in beginning to understand why things are the way they are and how others could be viewing the same situation differently than we are. The media we consume plays a huge role in this (see here: Political Polarization & Media Habits from Pew Research Center). So, the next step, and answer to the third question, is to make sure that you’re getting input from “the other side” (if you have a particular bent left or right) or both sides (if you feel like you don’t belong on the spectrum at all or if you feel stuck in the middle). It’s important that wherever you’re spending time getting news and information, you don’t create an echo chamber. As a liberal person in a deeply conservative region, I don’t need to curate my timelines too strictly; it happens naturally for me, both online and IRL. If the people around you mostly agree with you, it’s easy to only see the facts that confirm your opinions. (That being said, I’m not above blocking someone who regularly posts vitriol or fake news.) If you’re getting your news from TV, switch channels once in a while. If you get your news online, go to multiple sites. If you get your news via social media, follow multiple (reputable) sources. (Also, check out these tips: Five Ways to Break Out of Your Online Echo Chamber.) It does take some effort, but it’s incredibly important to see from multiple perspectives in order to have a well-rounded, compassionate view of the issues. I looked up some charts to find the best news sources on either side. Obviously, this is somewhat subjective, but I didn’t see huge discrepancies. 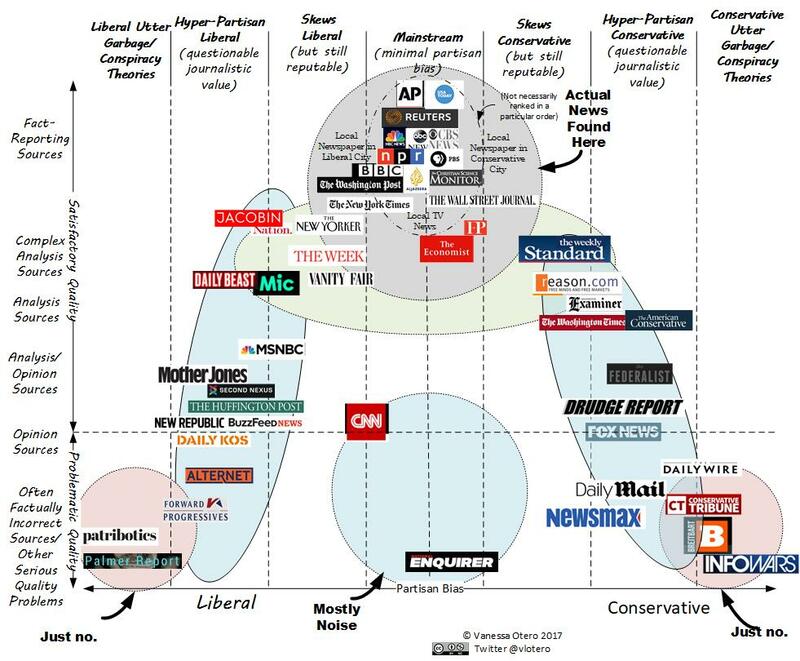 (Google “media bias chart” to see what I mean.) News sources like The Economist, The Atlantic, and Wall Street Journal both scored very well in terms of fact-reporting and minimal bias across most of the charts I saw (see photos). I am always interested in what we can do to help and ways we can use the information you have given us to get involved. Now that my social justice flame has been lit by a post, tell me what to do with that flame. You do this already, but I am definitely for it! // How can I get involved in social justice in my local area? Channon: What a great question!! There are many ways in which you can get involved in social justice in your local area. You can volunteer your time at a local organization that is working towards a specific cause. You can donate your financial resources to organizations who are doing great work locally, nationally or globally. Michelle also wrote a great blog post titled, “2017: But What Can We Do?” which lists some more ways in which you can get involved in fighting for social justice in your community. If you’re looking for something specific, but can’t seem to find it, get in touch with us and we will do our best to point you in the right direction. Michelle: What Channon said, plus protest and most importantly, vote! If you didn’t get to ask us that burning question back in August during the survey, don’t hesitate to ask us now! Comment below or shoot us a message on Facebook. In the survey we conducted last year, respondents had the opportunity to ask anything they wanted. We had some silly questions (When are you coming to Zimbabwe? ASAP. Can you croon? Channon – Yes. Michelle – No. What color is the sky? Depends on when you look at it! Why are you so awesome? Born that way 😉 ); we also had some personal questions, questions about Tuesday Justice, and content-related questions. Today, we’re going to tackle the questions about us and about the blog. We hope this sheds some light on who we are and what Tuesday Justice is all about! What do you see as your next step with Tuesday Justice? Do you want to move more into activism? Partner with any groups? Gain media coverage? What do you hope for the future of the blog? Channon: This is a great question! Our short-term goals would be to increase our social media presence on several different platforms, including Instagram and Twitter, and to continue to utilize Facebook. 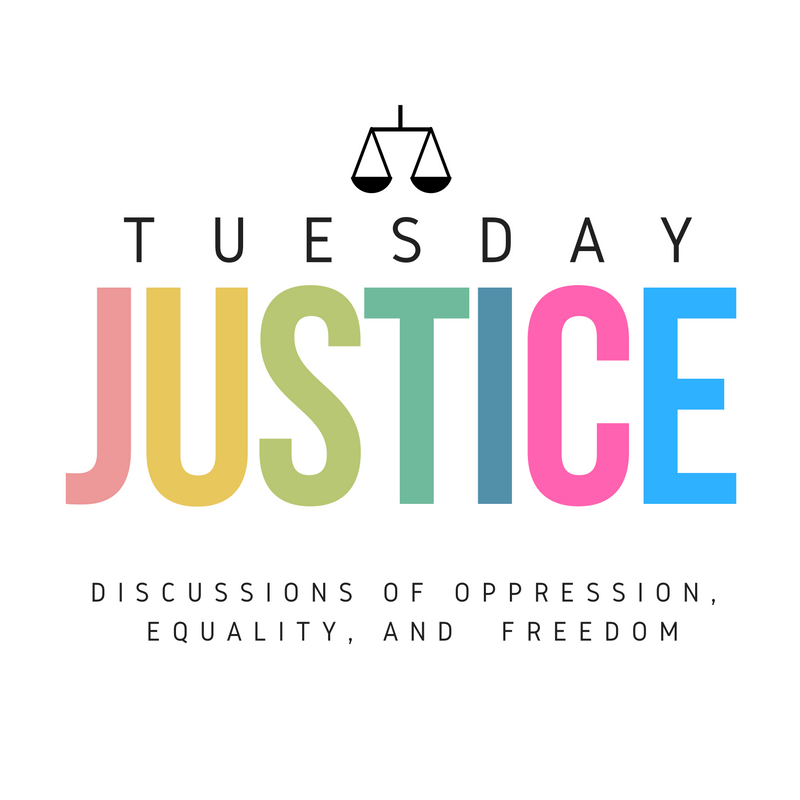 Our main goal at Tuesday Justice is to educate people on social justice issues that they may not fully understand or be aware of, and we just want to continue to pursue that. How do you feel you’re impacting your audience? Which audiences are most likely to read your blog? What level of expertise and engagement does your audience have with your subject matter? Michelle: We can only gauge this from the feedback we receive, so this may be a skewed perspective based on who we hear from. From the survey, and from what I hear from readers, it seems that our impact is primarily greater knowledge and understanding of social justice issues. And it’s clear this is leading people to really want to DO SOMETHING. One of the main requests from the survey is that people want more tangible ways they can get involved. So we’re definitely looking to improve in that regard. I think most folks who read Tuesday Justice are interested novices. And I would say that’s our target audience. We want to educate folks who aren’t in circles where they’d normally come across this information. How do you find the courage to have uncomfortable conversations and/or express unpopular opinions over the internet? Channon: I find the courage to have uncomfortable conversations and express unpopular opinions over the internet because I am passionate about what I am writing about and just want to bring awareness and knowledge to topics that people may not fully understand or just see one side of the issue. Some conversations about these issues may be uncomfortable, but they are necessary to have in order for a solution to come. Michelle: I have a very similar answer to Channon. I came across this quote from Martin Luther King, Jr. last year that sums up my feelings: “We are called to be people of conviction, not conformity; of moral nobility, not social respectability.” Bottom line: I need to be more concerned about justice for the oppressed than I am with my own comfort or popularity. How does being a Christian affect your views on social justice issues? Channon: Being a Christian affects my views on social justice issues because I understand and see these issues as an integral part of my walk with God. As a follower of Christ, it is my responsibility and privilege to do all I can to help those in need and be a voice and advocate for those whose voice may be silenced. Michelle: Yes! There are so many verses in scripture that remind me that it’s my duty as a follower of Jesus to continue His mission of proclaiming good news to the poor, proclaiming freedom for the prisoners, and setting the oppressed free. What would be your top three political reforms you would implement if you had the power to do so? Channon: 1) Canadian Black History as mandatory curriculum in all elementary and high schools across Canada, 2) reparations and healing for Indigenous and Black communities in Canada, and 3) tackling the high incarceration rate of Black males in the prison system. How have you found the balance of ushering in change and inviting others with you in an all-inclusive way, rather than guilt-tripping rhetoric that’s short and unsustainable? Michelle: The wording of this question suggests that we’ve been successful in doing this, and I hope we have! We certainly try. Our model is to present the facts first, then offer up ideas on how to make things better and how our readers can get involved in those solutions. This stems from my own experience: I didn’t become passionate about the Black Lives Matter movement from guilt tripping. It actually happened from one particular friend regularly posting information about the movement and the facts and statistics that demonstrated why it was so important. To be honest, I may have tuned it out if it had been guilt-trippy. What made you want to fight for this cause? // What began your journey of interest in the topics you cover in your blog? // Um, which cause arouse the desire to begin this movement? // What privileges did you grow up with and what was/is your personal journey of developing your own passion to promote social justice? // Why are YOU passionate about this? What’s YOUR story? The next turning point came when I was doing some research for a paper. I had gotten Richard Wright’s 12 Million Black Voices from the university library, I was sitting in a cafe, reading and making notes for the essay, “and suddenly, it was like the blinders were taken off.” The book showed me how, without question, the effects of slavery were still very real and present in 1941. And I could see the reality of its effect on present day circumstances for Black people in America. “My preconceived, sometimes subconscious, ideas about why things are the way they are came crashing down.” (I stole that line from my own post last year.) In studying modern slavery, I learned a lot about the transatlantic slave trade, African history, human rights law, development work, etc. My passion grew, not just for victims of modern day slavery, but for other oppressed groups, because the roots of oppression are so interconnected. In the wake of the Michael Brown shooting, one of the friends I worked with at WISE, a person I deeply respect, was regularly posting articles and information about racism, Black Lives Matter, why the movement was important, the oppression of black people in the US, etc. and it really helped me to understand the issue. At the time, I was working at TJ Maxx, usually in the fitting rooms, where I had a LOT of time to people-watch and think. I spent a lot of that time analyzing my prejudices and internalized racism. I think understanding my own racism helped me to understand systemic racism and racial inequality a lot better. We hope this Q&A has been helpful in understanding who we are and what Tuesday Justice is all about. If you have more questions, please don’t hesitate to ask! Comment below or shoot us a message on Facebook.